Welcome to Wow! Are y'all enjoying fall and all the fall inspiration throughout blog land? I know I have. And can you believe we are at the end of September? What?? Where on earth did it go? Before long we will be enjoying turkey and dressing and then a few weeks later exchanging gifts. Oh wait, I'm talking crazy....or am I? The holidays will be here before we know it.Before they sneak up on us let's look at some features from last week and get this party going! Great DIY fall sign by Her Tool Belt. 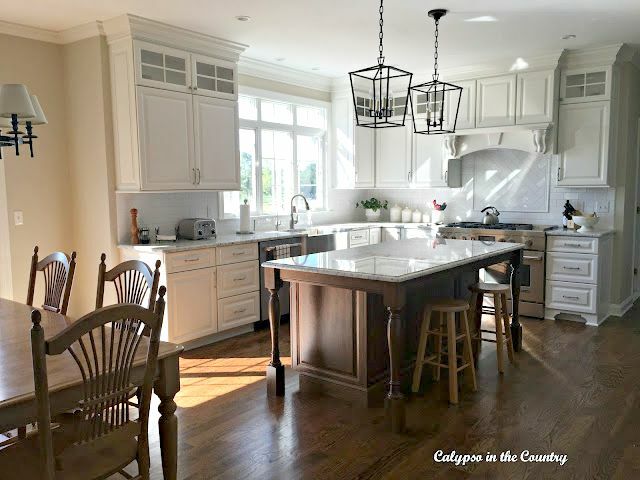 Shelley at Calypso in the Country finally has a beautiful new kitchen to share. I think my favorite is the windows that swing out over the sink. This is a cool wine rack using railroad spikes by Scavenger Chic. Find out how to make your own vinyl runner at 2 Bees in a Pod. This sour cream pumpkin cake sure looks good by Dots and Dust. Thanks to everyone who parties here with me each week. Y'all truly inspire me. Thanks for hosting Kim! September has flown by. Thanks Kim for hosting! We're new to the party and are so excited! I don't know why, but it seems all I want to do is eat with the weather changing, and that sour cream pumpkin cake has my name written all over it! Yes, September flew! Thanks for hosting, Kim. Thanks for hosting, Kim! Love the features! I cant' believe next week is October! thanks so much for hosting, Kim! Got to check out that sour cream pumpkin cake! I'm hungry right now so that looks mighty good to me! Enjoy the rest of your week! Thanks for hosting, Kim. That kitchen is fabulous! I'm a sucker for white! What great features! Love that kitchen renovation, and the Fall sign is adorable! September really did fly by. I made an appointment for this Thursday, and when the receptionist said, "See you October 1," I nearly fainted. How can time go so fast?? Lots of lovely features and I see several wonderful links I want to check out already! It was definitely a September to remember! Thanks so much for the party, Kim! Thanks so much for the party. Hope you are having a lovely week. Kim, how exciting to see my kitchen featured over here! Thank you so much for including it this week and for hosting once again. Enjoy the rest of your week as we enter October! Thanks for the chance to party with you, Kim! Awesome features! Thanks so much for hosting, Kim!! Thank you for hosting this wonderful party Kim! I love all of the features. So many creative people out there! Enjoy the rest of your week! Thanks for hosting the get together Kim! And you're right, the holidays are right around the corner, oh my! It's a pleasure to be here and, no, I don't know where September has gone. In fact, I don't know where the year has gone! LOVE Shelley's kitchen! Thanks for hosting Kim! Kim, thank you for hosting each week. Have a great week! Lovely features, Kim! Thanks for hosting! Thank you so much for the party, Kim! Have a great week! Oh my gosh - what a wonderful surprise! 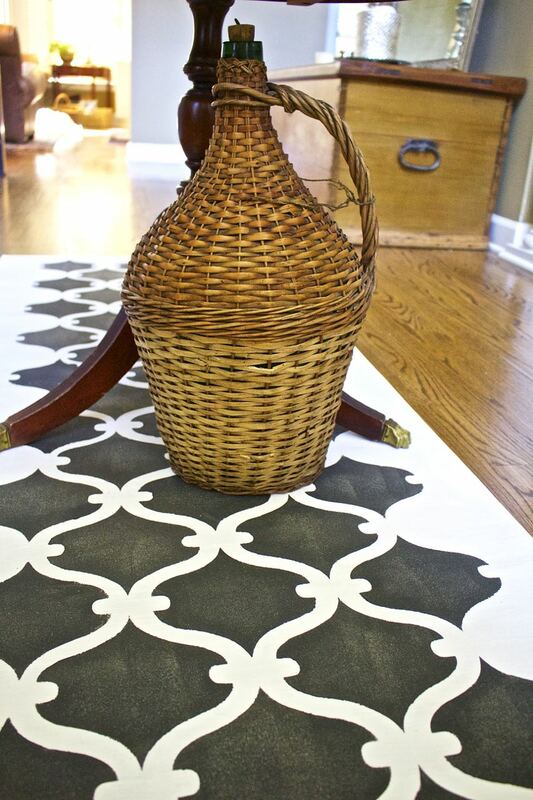 Thank you so much for featuring our painted vinyl runner! We appreciate it so very much! Thanks so much for the party, Kim! Heading off to visit some of the links. Thank you so much for featuring my Fall Sign, it's so exciting! Have a great day. My favorite time of year! Beautiful party, thanks for hosting! Have a great week! Wishing you the happiest fall season ever!! Thank you for the party! Im so bummed that I didnt link back to your site properly last party, But I made sure that it worked this week!!! Great to be a part of Wow this week! Thank you for hosting, Kim.